Dental Clinic Bangkok At Smile Dental Silom Branch, Bangkok. Dental clinic Bangkok Smile Silom Branch welcomes patients from all over the world to experience advanced dental care at its finest here in dental Bangkok Thailand. We provide world-class expertise on all forms of cosmetic dentistry, implant dentistry, and restrorative dentistry,as well as orthodontic care and other preventive treatments at very affordable prices. We also specialize in Smile Makeovers and Full-mouth Reconstruction Techniques. Our Bangkok Smile dental ultimate goal is a healthy great smile and a better you. Our Bangkok dental clinic is fully-equipped with the latest in cutting-edge cosmetic and restorative dental technology, so rest assured you will be getting the best when you want to obtain a gorgeously beautiful and healthy smile that can only be unique as you are. 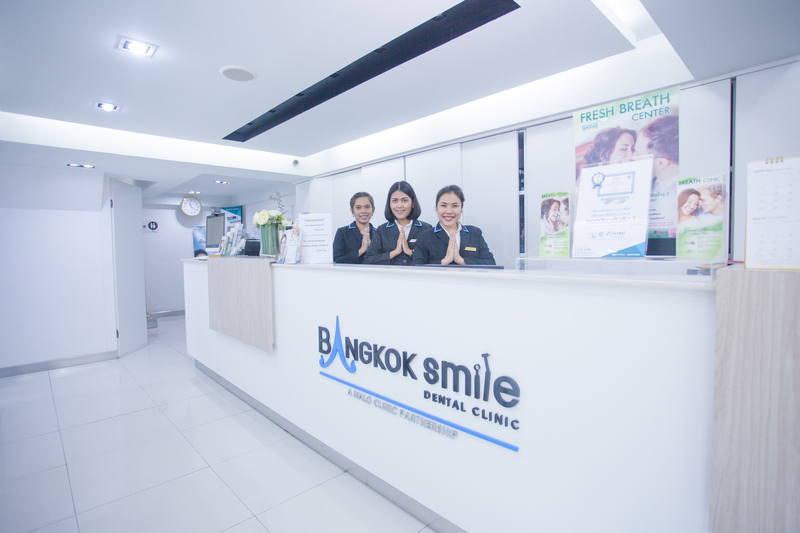 Bangkok Dental Smile Silom Branch is staffed with outstanding dentists and very accommodating staff, so you will certainly feel at home and experience the most comfortable and relaxing dental visit in a very warm ambience at Bangkok Dental Smile Silom Branch. "There is no better place to achieve the smile dental clinic of your dreams than in the Land of Smiles itself." We at dental clinic Bangkok, Silom Branch are truly dedicated to change the way people feel about dental clinic/office visits. We Bangkok Smile dental firmly believe that heading your way to a dentist doesn’t have to be associated with a painful or traumatic experience. Since 2003, our dental group has set the bar of excellence in the dentistry field here in the Land of Smiles. We’ve made our patients from all over the world feel at home and as family while providing them with unparalleled dental care services. You can truly expect the most relaxing and comfortable dental care experience, and return home feeling satisfied with the results as we do whatever is in our power to ensure you of the best dental holiday you can ever get here in dental Bangkok, Thailand. At Bangkok dental clinic, Smile Silom Branch, we can easily bring back your radiant white smile using the latest most advance teeth whitening treatment options. We Bangkok Smile dental only offer the best because it’s what you truly deserve. You can choose among our three options that would fit your time, lifestyle, and budget. Our Bangkok Smile dental whitening treatments are guaranteed to bring back your pearly whites in the most comfortable and relaxing setting while producing astounding results. A Porcelain Veneers Treatment is a cutting-edge cosmetic dentistry procedure when it comes to restoring your smile if you have stained/discolored, slightly chipped/broken, fractured, or oddly-shaped/misaligned teeth. This brilliant innovation would be the ideal approach to easily transform your smile into its most dazzling appearance without the need for complicated or time-consuming procedures at Bangkok Smile Dental Silom Branch. Dental Crowns are used to protect, restore, and support broken or weakened teeth. If your teeth are severely discolored, sharp, or malformed, dental crowns can also be placed over them for restoration. They may as well be used to cover a bridgework or large dental filling. Furthermore, dental crowns are like protective hats which can help prevent further damage to your tooth/teeth. We Bangkok Smile offer both conventional and advanced crown fixtures to help protect your smile and get you back to looking and feeling your best at Bangkok Dental Smile Silom Branch. A set of crooked teeth can easily steal away your gorgeous smile whenever you feel like sharing it with everyone. In due fact, you may be surprised to know that the benefits of having properly aligned teeth extend far beyond a confident smile; Straightening your teeth can actually affect your overall dental health. Just think about it — a smile dental clinic Bangkok can hardly be perfect if it's not a healthy one At Bangkok Dental Smile Silom Branch. Equipped with cutting-edge technology and using the most advanced techniques, Bangkok Smile Silom dental Branch boasts of being one among the few dental clinic Bangkok in Thailand that can truly be categorized as “fully-digital.” Utilizing state-of-the-art Dental X-rays, CT scans, and the power of CAD/CAM Technology to provide full and precise diagnosis of your oral health condition, you are ensured of a comprehensive and personalized treatment plan based on your specific needs and wants. An earnest and meaningful relationship is what we aim for in order to satisfy our clients. We Bangkok Smile dental truly believe that this is the best way to provide exceptional dental care to people of all ages and from all over the world. Ambitious as it may seem, our goal is to deliver incomparable treatment services in the most modern, caring, hygienic, and professional approach. We make this possible through our long experience, world-class expertise, utilizing modern technology, and our passion for perfection in service. At Bangkok Dental Smile Silom Branch, beauty is just a smile away. A dental laboratory serves as the backbone of every dental clinic, to be able to render top-quality services to its patients, particularly on the prosthetic phase of every dental treatment. Inside the dental lab is where art & science blends, where both are driven by modern technology to be able to fabricate corrective devices and dental restorations with fast & perfect results at Bangkok Smile Silom Branch. Our Bangkok Smile modern denture processing units and sophisticated porcelain ovens are able to generate great aesthetics and strength for all prosthetic products. We utilize the biggest leap of advancement with which the field of dental laboratory technology has achieved in the past decade – CAD/CAM Technology and CEREC® Dentistry. Bangkok Smile Silom Branch is among the few and privileged clinics in Bangkok, which houses a professional laboratory. Our dental clinic gives its fullest attention to the most reliable sterilization processes available. We adhere ourselves to the highest level of international sterilization standards. We utilize Autoclaving Techniques to sanitize and CE Certified Sterilization Units to maintain all dental equipment and tools, on top of them being meticulously monitored using our 3M Attest™ Biological Monitoring System. Our Bangkok Smilespecialists and every personnel are trained to maintain a clean environment on every inch of our facility to ensure your safety, comfort, and confidence for every treatment that will be performed. Rest assured, you are in good and clean hands inside our dental Bangkok.